Turmeric popcorn with garlic and dill takes just minutes to make on the stovetop. Cooking stovetop popcorn with coconut oil yields light and fluffy popcorn that isn’t greasy at all. 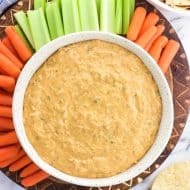 This healthy snack is colored naturally with ground turmeric! Up until a few years ago I was under the assumption that making homemade popcorn was a big to-do. Not sure why? I guess I figured if they made bags of microwave popcorn, than the alternative must be a pain to make or require special popcorn-making equipment. As it turns out, that’s not the case whatsoever. 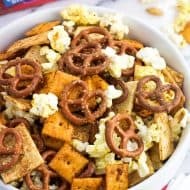 All you need is a large pot, a little bit of oil, popcorn kernels, and your favorite popcorn seasonings and you’re all set for your next snack attack. 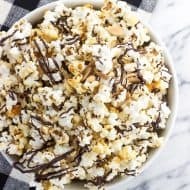 I love to use coconut oil to make stovetop popcorn because it melts quickly, doesn’t burn, and doesn’t leave the popcorn kernels feeling greasy. 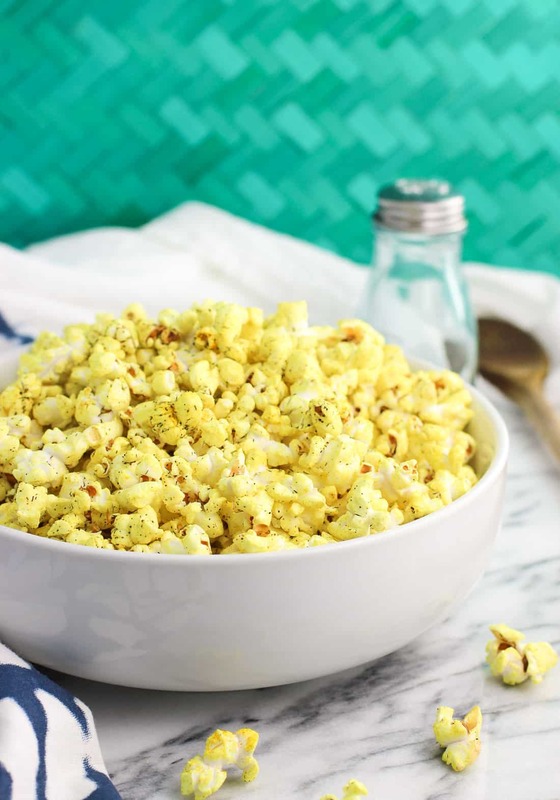 Just two tablespoons are used to make the batch of quite a few servings, making this turmeric popcorn recipe a healthy snack option. Especially since popcorn is 100% whole grain and a good source of fiber. Now let’s talk seasonings. We’re all familiar with neon yellow movie theater popcorn, which for obvious reasons isn’t an everyday kind of snack food. This turmeric popcorn plays on the nostalgia of movie popcorn, except the all-natural coloring is provided solely by ground turmeric! 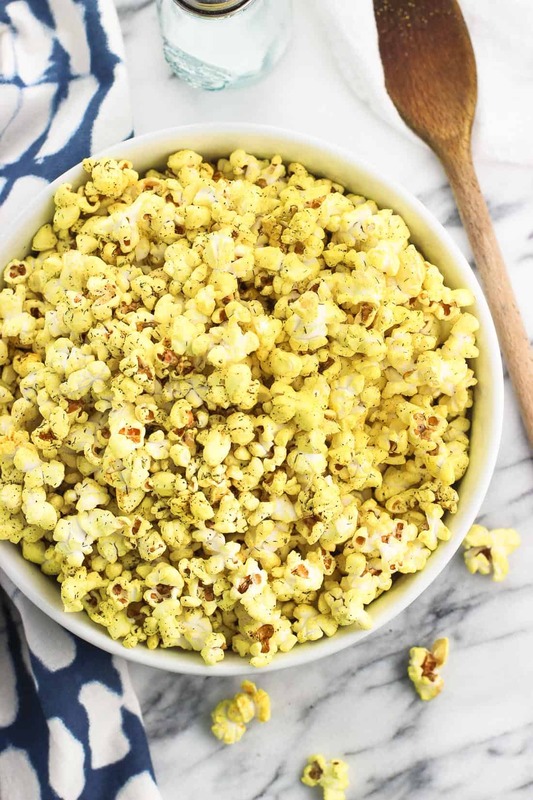 The trick to coloring the popcorn evenly with turmeric (and the salt, garlic powder, and dried dill) is to add it to the melted coconut oil just before pouring in the popcorn kernels. This way the kernels will be coated evenly by the turmeric as the popcorn pops. Once the popcorn has slowed to about five or six seconds between pops, you’ll want to remove the pot from the heat and crack the lid to allow the steam to escape. Trapping the steam risks your popcorn becoming soggy = no bueno! I actually prefer not to coat the popcorn with extra oil once it’s popped, but you can certainly do that if you like. The last step is to toss the popcorn with a few extra shakes of garlic powder, salt, ground turmeric, and dried dill to taste. Salt is a popcorn must (like in this salted lime popcorn! ), and garlic is practically my right-hand spice, so those two were obvious additions here. 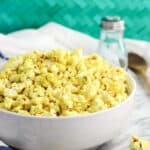 The earthy flavor of turmeric works really well with dill, and all together provide a well-rounded flavor for this homemade popcorn recipe. If you have any popcorn left after digging in, store it in a food storage container with an airtight lid and it’ll remain crunchy. 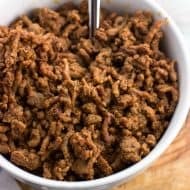 I recommend prepping all of your ingredients and having them ready to go because this recipe goes quickly. It’s go time once the first kernel pops! The popping will only take a few minutes. Once the kernels are added to the saucepan, I move the saucepan back and forth over the burner to continually shake up the kernels. This helps prevent kernels staying on the bottom and burning. Stir together 1/4 tsp each of salt, ground turmeric, garlic powder, and dried dill in a small bowl. Set aside. Add coconut oil and about 2-3 popcorn kernels to a large saucepan set over medium-high heat. Keep a close eye as the coconut oil melts and watch to see when the first kernel pops. Once the first kernel pops, add the spice mix and immediately add the rest of the kernels. Put the lid on the saucepan, put on oven mitts, and grab the saucepan by the side handles. Shake the saucepan side to side on the stovetop (you'll hear lots of popping), until the popping begins to slow down to about 5-6 seconds between pops. Remove the saucepan from the heat. and crack the lid so the steam can escape. Sprinkle extra salt, ground turmeric, garlic powder, and dried dill to taste. Store excess in an airtight container. I love homemade popcorn made with coconut oil. But with turmeric?? That’s an amazing idea!! Homemade popcorn is my favorite! Now I’ve got a craving for it for breakfast haha. Love that tumeric in here! 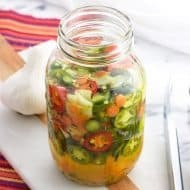 Such a great flavor, especially with the garlic and dill.